Drones for indoor inspection of cluttered spaces face a different type of challenge than in large open areas. Typically, in cluttered spaces the density of obstacles or the size of the environment do not allow a clearance of more than about 2 meters on each side of the drone during a standard mission. Considering ships, ballast tanks fit for instance this definition, as they often involve flying through manholes, and in confined spaces where walls are often as close as 1-2 meters apart. The flight must be carried out beyond line of sight of the operator, with a take-off location often outside of the tank to maximize safety, which means that the drone cannot be monitored through a direct visual line of sight. Considering the challenges of flying indoors or close to obstacles, fixed protections are often added to drones in order to handle collisions, which are impossible to avoid with existing sense-and-avoid technology. 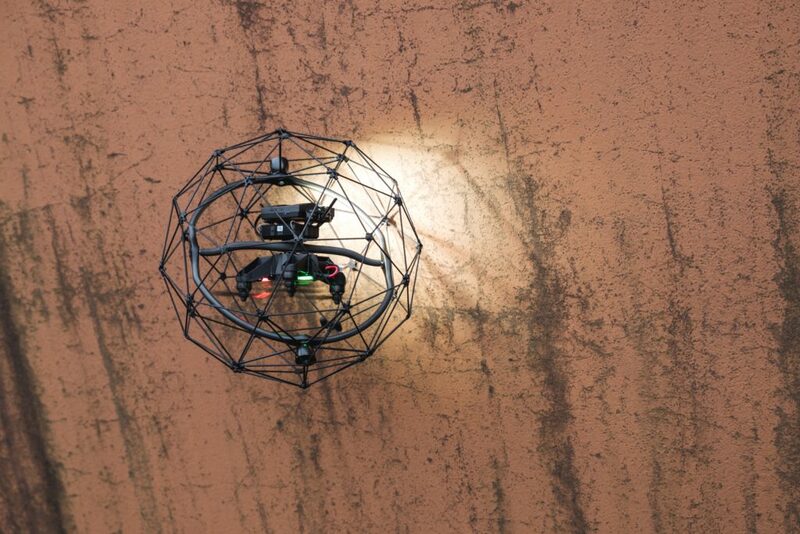 Flyability is leading research and development efforts towards safe indoor drones capable of tackling the above challenges and provide visual inspection solutions for confined spaces. It released in 2016 Elios the first collision-tolerant flying robot, designed for industrial inspection professionals, which builds on patented technology developed at EPFL. Flyability’s technology allows drones to remain unaffected by collisions, unlike conventional drones equipped with fixed protections which can in general only prevent the propellers from breaking, but can’t prevent the drone to crash when they touch an obstacle. This is because collisions destabilize the drone and they usually cannot recover before hitting the ground. Typically, the spherical protective cage of Elios is entirely decoupled with 3 degrees of freedom from the drone itself so that the robot is not affected by collisions: only the external cage is destabilized and the robot can thus continue flying after a contact as if nothing happened! Flyability’s existing platform is able to access cluttered environments such as ballast tanks; however there is still a lot of progress that can be achieved in order for such indoor drones to perform inspections more efficiently, reliably and repeatedly. Typically, the drone currently requires to be manually piloted, which implies that the surveyor has piloting skills, or that he is assisted by a trained pilot. In dark and complex structures, piloting beyond line of sight through the live video feed is particularly challenging, and may require several tries before the right picture is obtained. In addition it may happen that the pilot gets disoriented during the mission while piloting the drone, which makes it challenging for him/her to localize the data that the drone captures, or to find the way back to the manhole. While some drone-based inspections of ballast tanks are already possible, these challenges outline ways for making drone-based inspections more efficient. 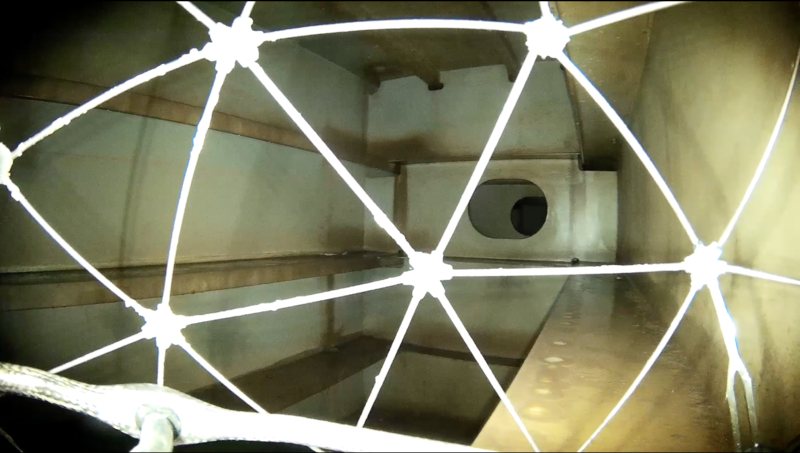 Improving the ease of use is key for improving the efficiency, reliability and repeatability of inspections, which are paramount to democratizing this technology and its benefits around the world for ballast tank inspection and beyond. In the long term, the goal would be that the drone-based inspection could be performed with little or no input from the surveyor during the data capture mission. He would only be involved in the planning and analysis, while the drone (or a swarm of them) would automatically extract the data in the tank very efficiently and repeatedly. Towards this end, a large advantage of a collision-tolerant drone like those of Flyability is that the automation can be optimized for localization and path planning, while obstacle avoidance only comes second with low criticality, considering the drone can afford collisions. This scheme is usually reversed for drones that cannot survive collisions (they must optimize obstacle avoidance first and have it “bullet-proof” to avoid any collision). The opportunity is that collision tolerant drones will be able to use simpler automation techniques than non-collision-tolerant drones, in particular as the complexity of the environment increases. Indeed, in difficult environments, the localization task complexity remains similar (if not lower, as more distinguishable features may be present) while the obstacle avoidance task complexity increases. The work during the ROBINS project is expected to push the state of the art in indoor drone automation by tackling the challenges found inside ballast tanks, such as dealing with: darkness, complex shapes, lack of visual features, lack of ground or ceiling, reflective surfaces. 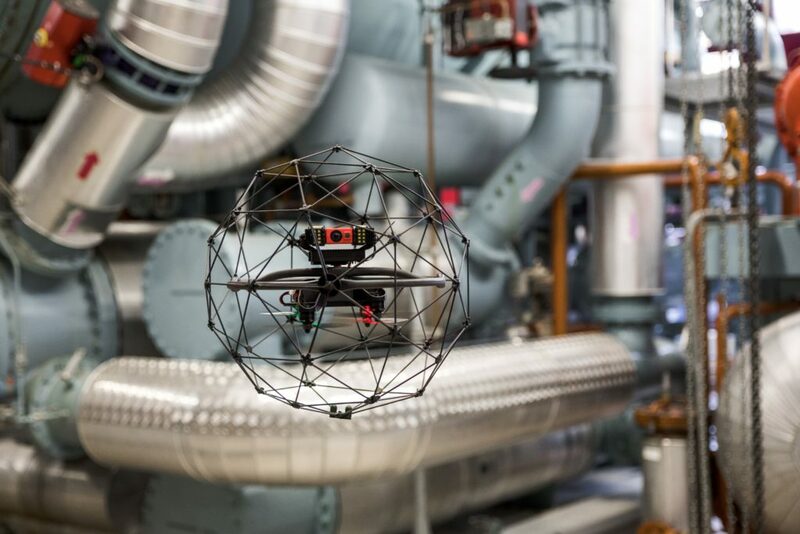 In order to provide a solution that can be integrated on a drone small enough to fly in ballast tanks (typically flying through manholes of 40cm), an additional challenge is to develop solutions that fit in stringent weight constraints. Indeed, the smaller the drone, the lighter the payload it can carry.